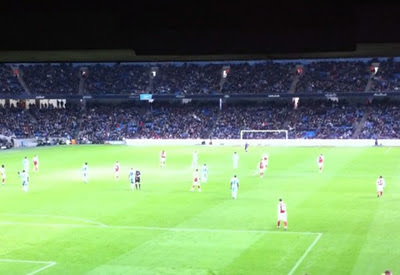 New for 2011/2012 on AshburtonGrove.co.uk is a series of articles about the ups and occasional downs of being a Gooner at an away match. Here Reuben Lewis gives his experiences of Arsenal's 1-0 defeat against the Premier League leaders Manchester City. On the morning of the game, I woke up at around 8am, buzzing with anticipation. 'Hopefully it'll be better than my last trip to Manchester', I thought. As my father, my friend and I drove to Euston station, I could feel a sense of excitement in the car - we were quietly confident of leaving Manchester with all three points. We agreed that four points from City and Villa would be very good, whilst three wouldn't be the end of the world. We parked the car and headed to the station, where we saw as many City fans as we did Gooners. Walking along the train carriages, I saw many familiar faces - it seems each away game adds more nameless faces into the Arsenal album in my memory. The journey up was easy, unlike my last trip to Manchester, where it seemed Virgin trains were conspiring against us to make our journey as complicated and stressful as possible. Upon arrival, at 1:08 to be precise, everyone headed to the balcony bar in the station. All those who looked remotely under 21 and had no ID were kicked out, and it got a bit rowdy. Eventually the police came and the situation diffused. irresistible offer of my hand shake. So that was an interesting start to proceedings! We headed round to the away block, only to be told we couldn't go in (something to do with the stewards/police not being ready). Consequently, we ambled along the outside of the stadium and had a quick look round the club store, mainly to escape the freezing weather! When in the store, our red and white scarfs resulted in a few glaring looks from the locals, making us feel we'd overstayed our welcome. It wasn't too long before we left, and headed towards the away end again. was all I was going to be asked, I was slightly underwhelmed. Guess my TV career won't be kicking off any time soon. However I was still pretty chuffed with my 20 seconds of fame on Sky Sports! Moments later, a friend of ours called Adrian, previously mentioned in my Udinese away day article, greeted us. With around an hour till kick off, choruses of Arsenal songs echoed from the concourse. I couldn't wait to get in there. We entered the concourse to the crescendo of 'we love you arsenal, we do', however it didn't take long for the anti-Nasri chants to start! When his name and picture were displayed on the TV screen in the concourse, carnage ensued! Dozens threw their beer and other objects towards the screen, with great accuracy may I add. Shame our finishing wasn't as accurate! Everyone was just going mental- it was pretty hilarious! I haven't seen a player hated by Gooners with such vociferousness since the charming Ashley Cole. There were some hilarious songs, most notably one addressing City's Europa League adventure. It went by the tune of Jessie J's Price Tag: "You've got the money money money, you got the money money money, but you're playing on a thuuursday, you're playing on a thuuuursday!" Kudos to whoever made one that up! During the game, we generated great vocal support, as per usual. I was feeling pretty nervous as we were looking defensively vulnerable against their pacey attack. They could have been three up at half time, so with the score at 0-0 I was more than happy. Before the start of the 2nd half, Kolo Toure ran over to the away end and applauded us, which was a very nice gesture. 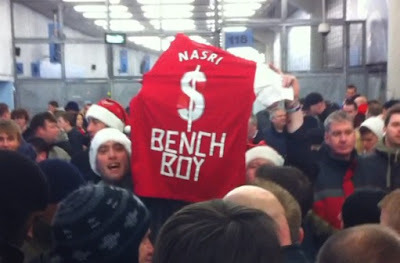 What a contrast he is to Nasri. Kolo left for all the right reasons and is a gentleman. Don't need to say much about $amir. When City scored, I can't say I got that sinking feeling, as I, along with most, pretty much expected them to score sooner or later, it was just a matter of how many we'd score. After seeing several late challenges go unpunished and a clear penalty denied, we sung 'how much they paying you?' to Mr Dowd, who gave penalties against us for fun during the 4-4 at Newcastle last season. lost to a club who have spent obscene amounts of money, and had it not been for the ref, would have got a more than deserved draw against the league leaders. Choruses of "We love you Arsenal" continued with passion and pride after the final whistle-showing it wasn't just me who appreciated the team effort. We walked to the station in icy and slippery conditions. A bit of banter, edging on hostility, followed as Gooners pouring out the stadium sung 'Thursday nights, Channel 5". Some City fans took it with a pinch of salt, however some were less than happy. 'We're top of the league you mug' said one home fan. Fair enough. You'd hope so after £500m of investment! Speaking to a City fan on the way to the station, he said we were the first team this season to come to the Etihad and have a real go, adding it was one of the best games he'd seen in a long time. On the train home everyone seemed to be in good spirits, which was good to see. Despite the result, I had a lot of fun in Manchester, as the above shows, and hopefully Villa will provide the Christmas present we all want - three points. Rueben Lewis writes his own blog. You can follow him on Twitter. AshburtonGrove.co.uk is looking for a fan heading to Swansea on January 15 to write about their away day experience. If you'd like to get involved, contact us via Twitter or Email.